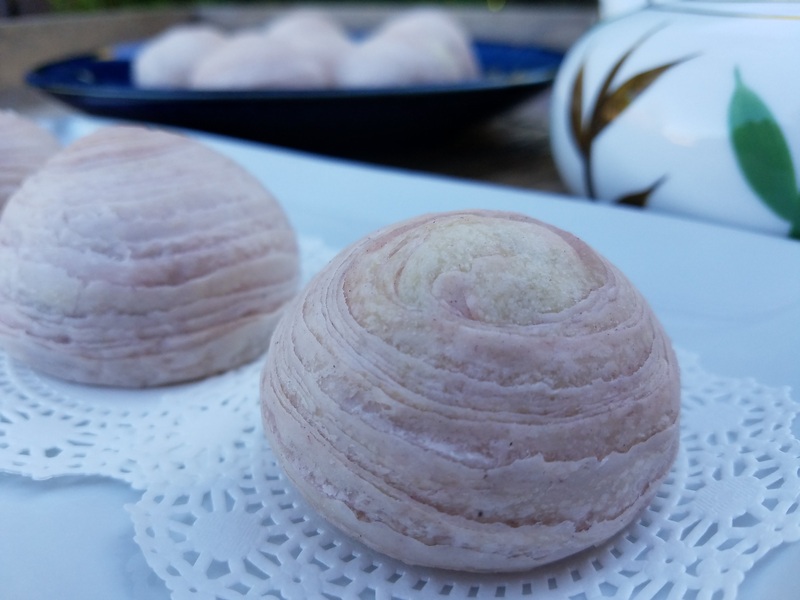 It is time for me to honor the Mooncake festival with some home-baked taro moon cakes. 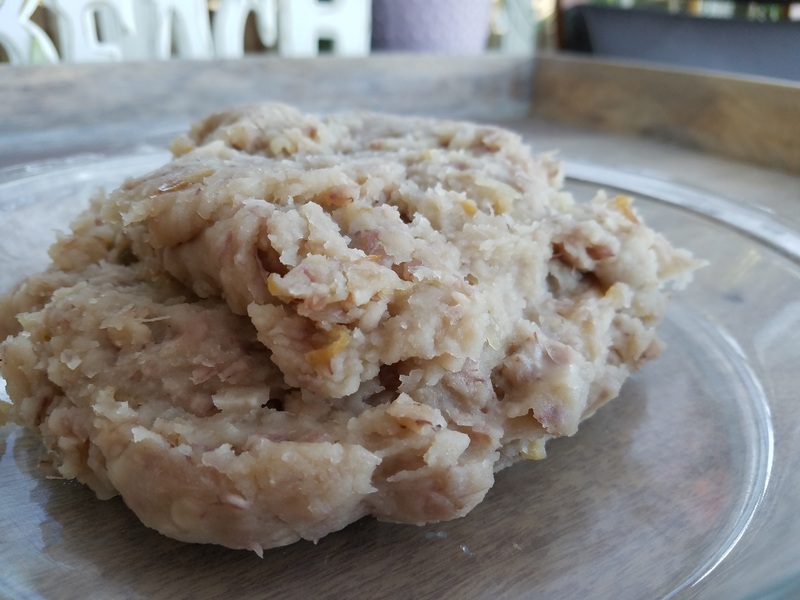 I made the filling true to the Teochew tradition, with yam paste fried in shallot oil. Very happy with the outcome from my first attempt. The crust is flaky, and the filling is sweet and fragrant. Took me a long time, but the process is therapeutic. 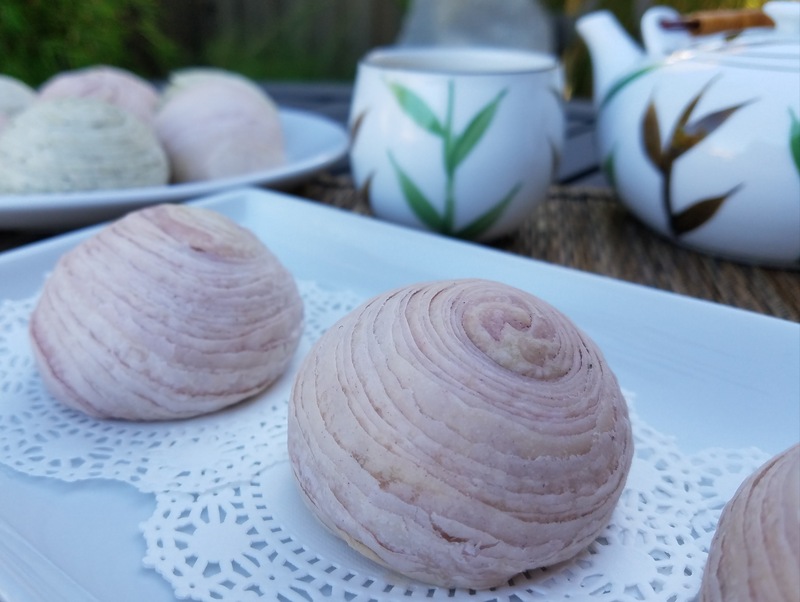 Now it is looking more promising that I will attempt other types of mooncakes, … thinking snow-skin durian moon cakes… saving that thought for next year. Remove from steamer and immediately add the sugar and mash with a potato masher until the taro and sugar is well combined turn into a paste. Knead with a baking glove if needed to ensure the taro is fully mashed. Note that you have to mash the taro while it is hot, else it hardens when cooled. Heat oil in a wok over medium high heat. Fry the shallots until it is fragrant and starts to turn light brown. Add the taro paste and continue to fry until the oil is incorporated into the paste. Cool completely. Cover with cling wrap until ready to use. Add all the ingredients into a mixing bowl except the water. Using a pastry cutter, cut the clarified butter into the flour mixture until the mixture looks shaggy. Add the ice water and continue to cut the mixture until a dough forms. I use a spatula towards the end to bring the dough together. Cover with cling wrap and set aside to rest for 30 minutes. In a separate mixing bowl, cut the butter into the flour until the mixture is grainy. Use a spatula and fold the mixture until the dough forms. Into half of the dough, add the purple coloring and knead until the color is evenly distributed. Cover with cling wrap and set aside. Into the other half of the dough, add the sesame powder and similarly knead until it is evenly distributed. Cover with cling wrap and set aside. Divide the taro paste into 20 portions, each measuring 35g. Roll each portion into a ball. Cover with cling wrap and set aside. You will have some left over taro paste. Make some taro milkshake with the leftover. Divide the water dough into 10 portions, each measuring 35g. Roll each portion into a ball. Cover with cling wrap and set aside. Divide the oil dough into 10 portions, each measuring 25g. Roll each portion into a ball. Cover with cling wrap and set aside. You will have 5 purple oil dough and 5 sesame oil dough. Flatten a water dough and wrap a oil dough in it. Seal and roll into a smooth ball. Cover and set aside. Repeat until all the dough balls are assembled. Flatten each dough ball with your palm, seam-side up. 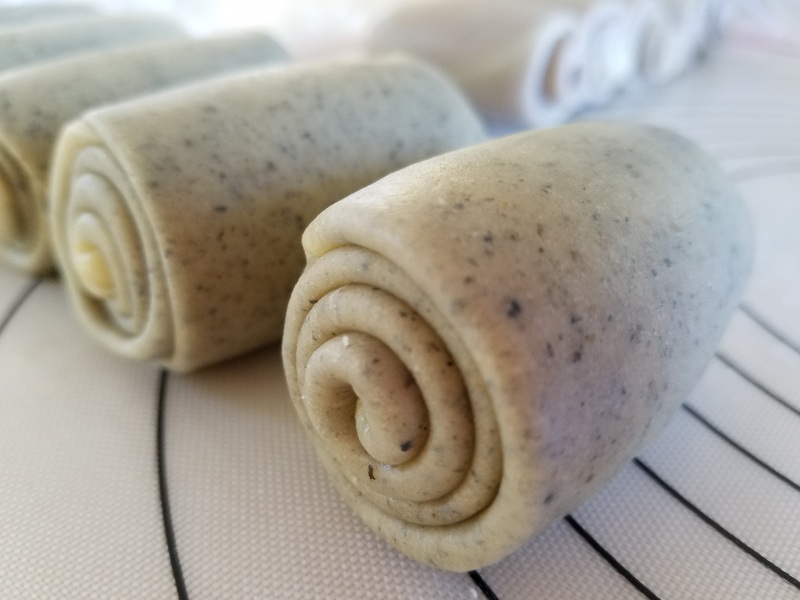 With a rolling pin, start from the center of the flatten dough and roll up and down once. 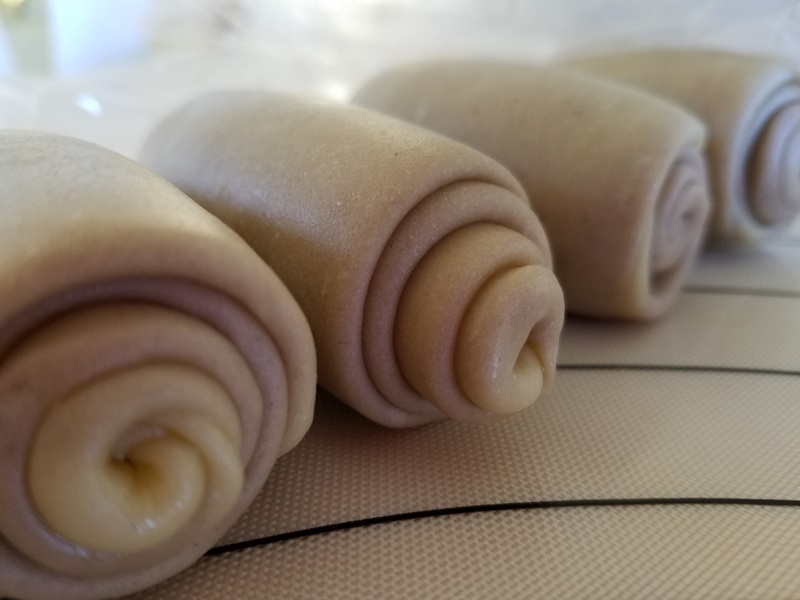 Pick up the dough from the top and roll the dough into a tight spiral, like a swiss roll. Cover and set aside. Repeat until all the dough balls are rolled into a spiral log. Preheat the oven to 338 degrees F.
Take a spiral log and roll it into a longer log about 1.5 times the resting size. Flatten the log again with your palm, seam-side down. With a rolling pin, start from the center of the flatten dough and roll up and down once. Pick up the dough from the top and roll the dough into a tight spiral. Cover and set aside. Repeat until all the all the dough rolls are done. 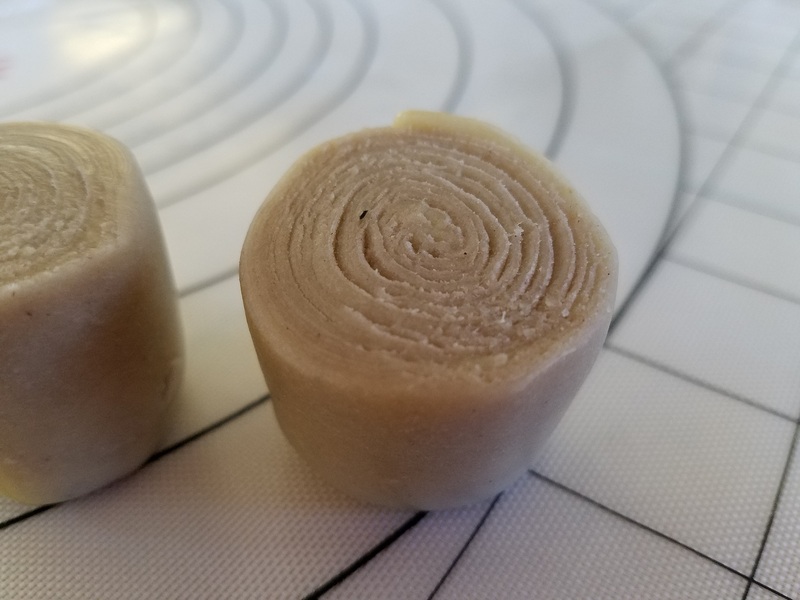 Using a sharp knife, cut each dough roll in half, seam-side down. Do not use a sawing motion as it will separate the spiral. Flatten each half with your palm, cut-side down. 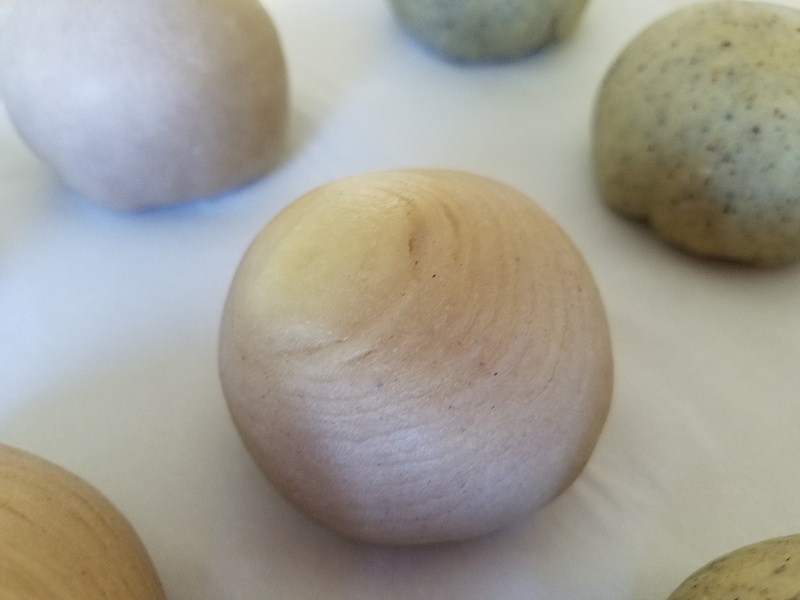 Use a rolling pin and roll the dough out into a disc about 1/4″ thick. 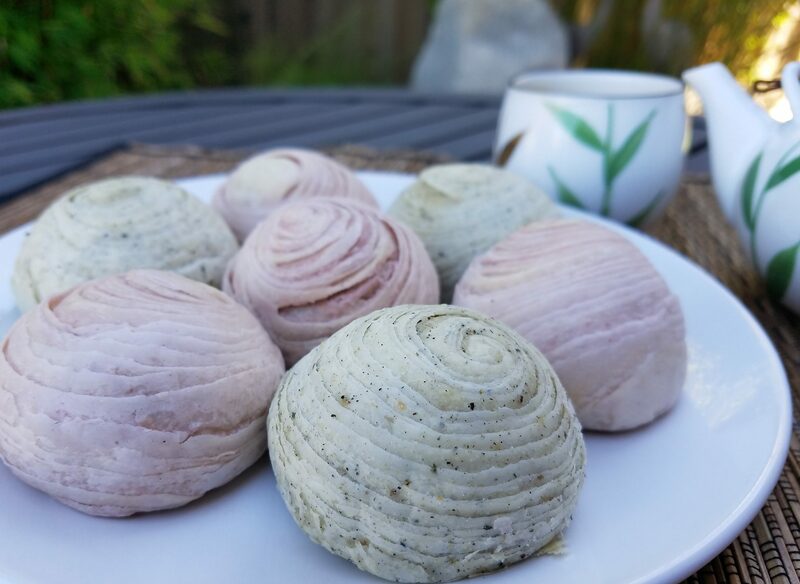 Place a taro ball in the middle and wrap the dough over it. Seal the dough, while shaping it. Arrange the assembled mooncakes on a baking sheet, seam-side down. Bake for 15 mins, turn the baking sheet and continue baking for another 15 – 20 minutes. Remove from the oven and cool on the baking sheet. 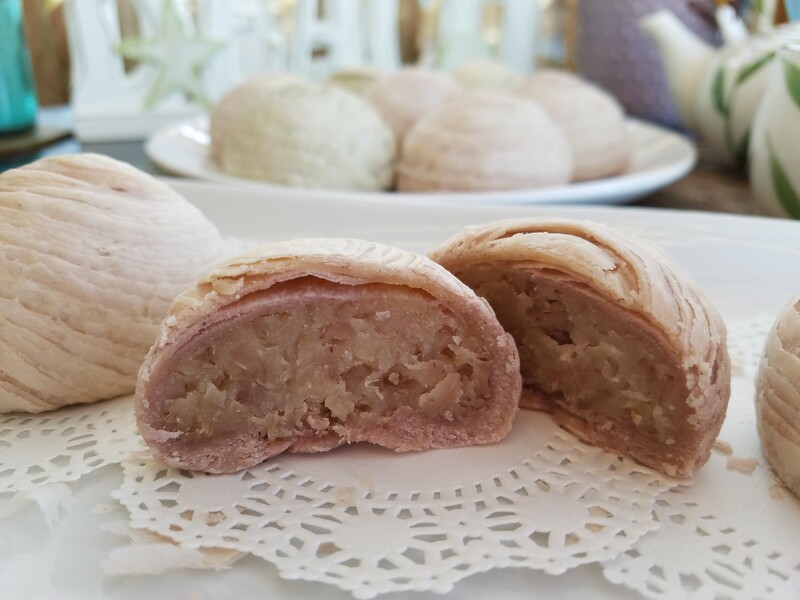 The mooncakes are very delicate and flakes easily. Cool and searve with Chinese tea. Happy Mooncake festival.